Your backyard is full of construction waste from the refurbishment of your home? Why not benefit from our professional rubbish removal South East London SE company. Better Cleaning Company provides efficient and affordable home and office, garden and after builders waste disposal and recycling. Call 020 3746 3201 or fill in online request for a cost-free viewing for an exact price offer now! If you are having trouble clearing out and disposing of the excess builders waste following the reconstruction of your home, we are 7/7 prepared to assist you. 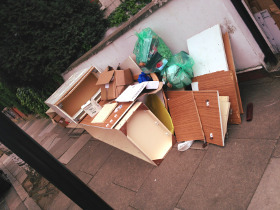 We offer high quality building waste removal South East London SE in accordance to all rules. Our waste disposal team will carry out all the hefty lifting and loading, and could be very useful for bulky waste clearance and all kind of remodelling debris removal. Our employees are background checked and taught to properly deal with your trash. They will show up with a truck for loading and carrying the builders waste to the recycling site. We will recycle more than 80% of your waste. For swift and efficient assistance in removing out unwanted things and rubbish from your home, get our professional waste disposal service today! Better Cleaning Company is an experienced cleaning and junk removal company in South East London with a very fine technique to each unique consumer. We are always committed to the personal demands and specifications a customer shows up to us with. This is the reason why our removal services are always so effective and popular. Organizing removal for you will be fully conducted to your deadlines, wishes and management requirements. We will certainly pack the luggage for you and we will give you even the packaging items. We are going to find man and van for the transportation and will be very mindful for your personal belongings - in particular for fine art, valuable items, decorative furnishings and hand-made indoor goods. In all scenarios we acquire not only the packing process, but also the suitable containers arrangement during the travel. If you demand personal travel assistance - like tickets, temporarily accommodation or administrative assistance with the address change, we can assist you, also. We offer efficient and reasonably priced garden waste collection South East London SE, loading & disposal. Our rubbish collectors are prepared to do rapid and appropriate green waste removal, brown waste removal and also waste recycling or dumping. They will certainly collect any grass or hedge cuttings, leaves, twigs, branches for you and dispose of it in legal and appropriate fashion. As a serious rubbish waste carrier, we have put into place a very simple booking system for our rubbish removal South East London SE services. Better Cleaning Company has a an effective hotline 020 3746 3201, available 24/7. You can order a free viewing or directly book our service. We promise you fast arrival. Our experienced 2 men teams to examine the situation and offer you a price estimate. We recycle on your behalf in a lawful way!